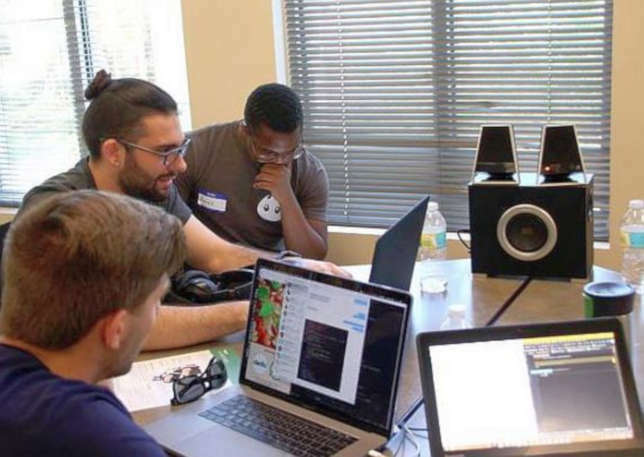 A Florida university's computer club added a day of crash courses to its annual hackathon. Stetson University's HackerSpace recently hosted both college students and high schoolers, who convened on the DeLand campus to participate in computer science challenges, a gaming tournament and workshops. "The Greater Central Florida Tech Faire + HatterHacks," as the event was called, took place beginning on Friday night, April 5, and ending Sunday afternoon on April 7. Over the course of about 45 hours, people learned how to build Node.js apps, work with Blender, do penetration testing, produce actions for Google Assistant and hear from tech experts, among other topics. Those who wanted an extra dose of competitive intensity slid into teams created on the spot to participate in a concurrent 24-hour hackathon. The goal of the event, according to the organizers, was to educate students about STEM and computer science while also encouraging them to pick up skills for creating technology. University faculty and industry experts led the sessions. "Hackathons naturally encourage small communities to form in which students learn from each other and work together to build sophisticated projects in a single weekend," said Joshua Eckroth, an assistant professor of CS at Stetson, in a statement. "Computer science isn't as scary as it seems from the outside," added Heyley Gatewood, a math and computer science junior. "It's everywhere. We carry technology in our backpacks and pockets and on our wrists. You can't be afraid to take the first step, and you can't be afraid of failure."